Archdeacon Panteleimon Papadopoulos was kind enough to send me a review copy of Μέγαν εὕρατο, the new recording released by GOA’s Archdiocesan Byzantine Choir. The disc is a collection of the festal hymnody sung at Great Vespers for St. Demetrios (chosen to honor Abp. 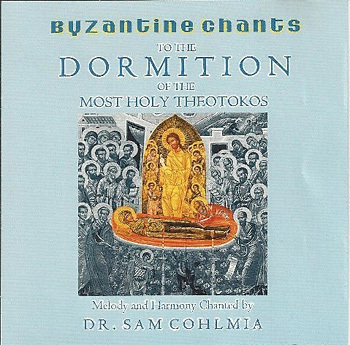 Demetrios), including the Anoixantaria (for those unfamiliar with the practice, Psalm 103 from “Thou openest thine hand, they are filled with good…” to the end is theoretically sung rather than merely read for major feasts in present-day Byzantine practice, although in my experience this is one of those things that a lot of people don’t do with the excuse that “nobody does that”), “O Lord I have cried” with stichera, Doxastikon, and Theotokion, hymns for Litya and Artoklasia, aposticha, apolytikion, and “Many years” for Abp. Demetrios. The ensemble, if I understand correctly from the list of participants, is a group of psaltes largely from the Northeast, including Dr. Grammenos Karanos, the current professor of Byzantine music at Holy Cross Greek Orthodox School of Theology, and others from the New York area. The first thing that must be said is that this is a wonderfully sung program; the wall of sound produced by these gentlemen is never less than first rate, and hymns with slower, more melismatic textures such as the Anoixantaria are particularly beautiful. One of the things that I try very much to do is to view recordings like this, labors of love by people who are clearly far more knowledgeable and able than I am, as master classes, opportunities to learn finer points that I haven’t had the opportunity to learn otherwise. I have been informed by a particular point of view that makes certain assumptions, and not everybody is necessarily informed by the same perspective and assumptions. (For example, given a number of factors, I tend to assume that even for Byzantine chant, choirs are ideal, with solo cantors needing to be judiciously used. However, I am well aware that for many people, for this repertoire, the solo cantor tends to be the assumption in terms of performing forces, with choirs only happening for special occasions.) To that end, there are questions that I have about aspects of the recording. Some of these questions veer into critical territory from an entirely subjective musical standpoint, but may well be entirely answerable in terms of style. First off, something that is immediately apparent has to do with repertoire choices. These are, with a couple of exceptions, not selections out of what have been represented to me as “the classical books”. The melody used for the prosomoia at “O Lord I have cried”, for example, “Ὢ τοῦ παραδόξου θαύματος”, is not the melody found in the Irmologion of Ioannis Protopsaltis, and the Kekragarion is not from the Anastasimatarion of Petros Peloponessos, either. They’re not bad, necessarily (although I have to say I definitely prefer Ioannis’ melody for the prosomoia), but I am curious about what informed the selections. Second, there’s a tendency throughout the disc to cut off of endings of phrases (including isokratema) quite sharply; this is something that makes sense to me to do as a solo cantor, so that the congregation knows that the places where you’re breathing are intentional, but it makes less sense in a choral setting unless there’s a specific stylistic reason to do so. It’s obviously a choice, and one that is executed distinctively, carefully, and consistently, but I’m left wondering if it’s necessary for it to be as prevalent as it is here. Third, the apichimata are sung chorally, which makes me wonder if there’s a performance tradition for apichimata that divorces them from their function. Soloists sing the verses at the “O Lord I have cried” stichera, so it’s not simply a matter of everything being choral for purposes of this disc. Fourth, as performed, the ison moves around a lot more than I’m used to. I’m aware that this is a point where it seems everybody and their dog will tell you “the real way” you’re supposed to realize the drone, so I assume this is a stylistic point as well. Strictly in terms of the physical presentation of the disc, it would be nice to have had more of a booklet; the performance is entirely in Greek, and while many of the texts are reasonably familiar, for those not used to Greek an included translation would help make the product more accessible. Doubtless this is a function of production cost; perhaps an “online booklet” or some such would be a way of accomplishing this in a cost-effective manner next time. To sum up: this is a gorgeous-sounding recording that is probably best described as a snapshot of the state of Byzantine chant in Greek in the Northeast, which seems to be healthy indeed. I’ll be very interested to hear what the Archdiocesan Choir does next — the Archdiocesan School seems to doing a lot to try to raise the profile of Byzantine chant, and I’m looking forward to future developments.